New headlines provide ongoing evidence that IT Security teams are losing the battle against attackers, reinforcing the need to address the security of enterprise applications. 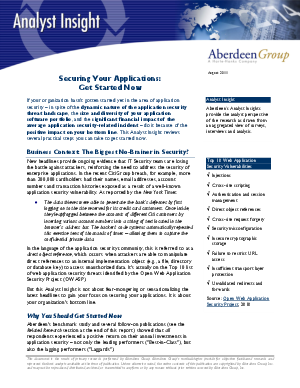 If your organization hasn't gotten started yet in the area of application security - in spite of the dynamic nature of the application security threat landscape, the size and diversity of your application software portfolio, and the significant financial impact of the average application security-related incident - do it because of the positive impact on your bottom line. This Analyst Insight reviews several practical steps you can take to get started now.